Fredo Pies & Ice Creams offer superbly made pies and sausage rolls, baked freshly onsite daily. 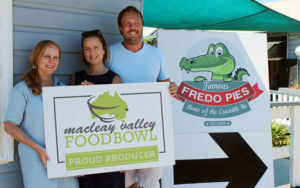 Including the famous Crocodile pie, Fredo Pies boasts 30 different pie varieties. In addition to the pies the café offers ice-cream, quality teas, freshly brewed coffee and a delicious range of pastries including apple pies and custard tarts.